DeSisti jumped into the LED fray with their Set Light DE LED. It is available in various configurations. The Set Light DE LED system was designed for use in production lighting for either key, fill or backlight. It can also be used as stage wash and down light. The FRE-LED combines high efficiency LED technology by Philips, with an efficient optical system that optimizes light output and control of the light beam. These color changing fixtures are DMX controllable as white sources with tunable color temperature from 2500°K to 6500°K, that it kept true over the life of the unit by utilizing a patented internal optical measurement system developed by Philips. Also in the booth was the Leonardo Multi-Power. It’s a compact, highly efficient 10″ Fresnel, capable of accepting a wide range of tungsten halogen lamps. It has a G22 socket accepts lamps available are 650W, 1kW, 1,2kW, 2kW and 2.5 kW. This allows the lighting staff to use one fresnel for a wide range of applications. What’s neat about the lamp housing is that the locking G22 lamp holder has an adjustable height mechanism that allows the use of a wide range of tungsten halogen lamps ensuring the are correctly centered in the reflector. HOT FLAGS – a new line of heat resistant flags for use with high temperature lighting fixtures. Manufactured from a patented, thermal resistant fabric, Matthews HOT Flags will allow precise cutting of the light at relatively close distance to large, heat-producing HMI or Tungsten fixtures. HOT Flags will withstand a continuous heat of 1800F/972C. They weigh approximately one-half the weight of metal Hi Temp Flags and will dissipate heat rapidly allowing for easier handling and faster tear down of the lighting set up. EXTENDELLINI – Matthews has made gripping capabilities even greater with this new tool. By simply removing the movable jaw, spin handle and bushing from the Matthellini Clamp and securing the new EXTENDELLINI to the thread of the clamp, users can increase the gripping range by almost a foot. Replace the jaw, spin handle and bushing and the extended clamp and fixture can be safely secured to a wide variety of objects. Like the Matthellini Clamp, EXTENDELLINI is a precision machined, chromed product for durability and ease of operation. MICROgrip – a broad range of mounting and grip products developed around the MICRO-griphead. Great in the studio for table top and product imaging as well as in miniature work, the micro gripheads allow all the moves and features of its bigger 2.50″ brother but in a smaller package. A further development by Matthews form the MICROgrip series is the MICROmount – a highly maneuverable and versatile on-camera light/monitor mount. It’s a highly flexible mount that will allow the photographer to get the on-camera light up from the camera body and off to either side to create dimensional instead of flat lighting. It will also serve as an on-camera monitor mount. BALLHead Camera Mounts – Unlike most other ball head mounts which are manufactured from die cast components, Matthews Ball Head camera mounts are individually CNC machined from solid bar stock to ensure precise control over all critical dimensions and elements. A precision machined camera quick release plate with a balancing feature offers quick, safe and positive-locking of the camera to the Ball Head Mount. The mounting plate can stay permanently attached to the camera thus avoiding the hassle of trying to screw the camera onto the ball or screwing the ball onto the camera. All heads mount either to the suction cup or other devices. Matthews Ball Head Camera Mount is available in three different sizes to accommodate particular camera weights. CT Overheads – Cool it up or Warm it Down. These new color-balanced, color-temperature grid cloth overheads will adjust ambient or overhead lighting up and down the Kelvin scale. Available in 1/4 CT and 1/2CT values in both straw and blue to compensate for varying daylight conditions or shifting artificial lighting sources, CT Overheads are manufactured form rugged grid cloth and accurately matched from lot to lot to ensure consistency of color and transmission. ARRI introduced its new Hybrid kits with both LED and Tungsten source lighting fixtures as a contemporary answer to portable lighting. Combining energy-saying efficiency, control and intensity these convenient kits draw less than 490w at 120v. ARRI Hybrid Kits feature the new ARRI LoCaster LED fixture with six selectable color temperature presets and an onboard dimmer. The unique mixing chamber ensures CRI over 90 and a ‘single source’ for impressive shadow quality. Having a LoCaster as part of an ARRI kit allows a shooter to work with both hard and soft light, and the ability to manipulate color temps without having to use gels on the LED source. Hybrid kits also feature ARRIs tungsten Fresnel units with excellent beam-shaping characteristics; ideal for background and backlight. ARRI is introducing the next generation of 1000Hz High Speed flicker-free Ballasts used for digital high-speed photography. The new ballast is available is several wattages included 125/200w, 400/575w 575/1200w and 250/4000w. The new high speed ballast can now achieve high quality, flicker-free images even at frame rates of 500-1000 fps and in many cases beyond. The new technology supplies the lamp with 100Hz square wave current, allowing worry-free shooting from motion picture, commercial and industrial high-speed scenes even with a single, HMI daylight source. Are you wondering what happened to Reflecmedia and want to know if you can still get your hands on their very cool chroma-key system in the US. Well, yes you can! Reflecmedia is now offering their products through Chromatic Distribution, Inc here in the US. 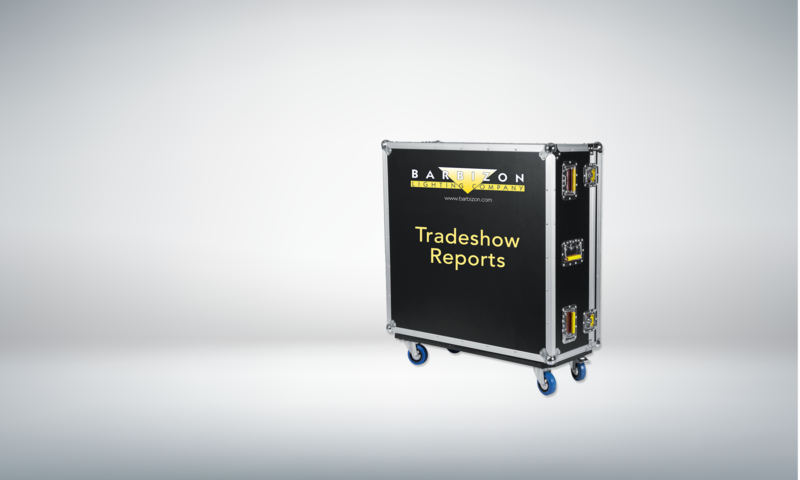 Barbizon has recently reestablished our distributor relationship for Reflectmedia through Chromatic Distribution and our customer service folks are set up to field your questions. Welcome back Reflecmedia! If you looking for a cost efficient Chroma-key solution for a major broadcast operation, simple student shoot or worship facility, the Reflecmedia system is something worth looking at. Reflecmedia recently added a chroma-key flooring material to their product offering called “Base Matte”. To avoid ordering the wrong camera mounting adapter with your system, Reflectmedia is now shipped all 4 of the most common camera mounts at no additional charge. They also were demo-ing their light control solution for broadcast windows, RoscoShade mechanical shades and RoscoVIEW. Rosco VIEW is a two-part system consisting of wide width polarizer filter in gel form and a matching optical glass polarizer camera filter. When utilized together, you are able to instantly control 100% of exterior brightness as seen through windows without affecting the lighting and exposure within the studio or set. mini set lit by the SeaChanger Nemo, the first color-changing fixture with a LIFI® plasma light source. The Nemo delivers an energy efficient class of high intensity lighting, using proven plasma technology – with the seamless, swipe-free color transitions you expect from the SeaChanger product line. You control the color, intensity and saturation of lighting with unprecedented levels of precision and ease. The fixtures are also available in an outdoor version called Nautilus. For you meter freaks they hinted that an updated version of their ColorBug may be available by LDI that measures illuminance, color temperature and will be able to determine CRI remotely sending the data back to an iPhone or iTouch. Miller had their new version of the Compass system including the Solo, a 75mm head on three-stage spreadless legs. Also in the booth was the Combination Pedestal for lightweight mobile camera support. The adjustable air-column system provides quick and easy height adjustment for payload configurations up to 60 lbs. You can readily adjust the camera to a suitable height and then lock off with the quick action clamp. The Combination Pedestal has a 100mm bowl to suit a Miller Arrow fluid head. The Combination Pedestal systems are also supplied with the #481 Miller Studio Dolly with cable guards and provide an ultra-smooth rolling action. Pelican extends their line of 51 cases with the introduction of the 1170 case. Designed as watertight/crush-resistant armor for handheld electronics and any small, delicate items, the case sports a high-impact, heat and chemical resistant polymer shell that will stand up to some of the harshest conditions known to man. As additional protection, the case features stainless steel hardware and double-throw latches that can stand up to 400 pounds of pull force, yet open with a light pull. The case’s tongue-and-groove lid construction and polymer o-ring creates a watertight seal and its built-in, automatic pressure equalization valve keeps moisture out and makes it easier to open the case at any altitude. To offer another legendarily tough, portable equipment protection solution, Pelican Products has introduced the 1460 Case. The top lid opens up 180 degrees to form a wide stable base. The lid can also act as additional storage space, offering easy access to equipment such as HD video cameras with accessories when secured within standard Pick N Pluck™ or optional custom foam. The 1460 Case is engineered with an open cell-core wall, polymer construction that protects sensitive equipment from the world’s harshest conditions. Standard features include a lid equipped with a polymer o-ring for a dustproof and watertight seal, as well as two dual action latches that have been tested to withstand nearly 400 pounds of pressure (but open with a light pull). The 1460 Case sports an integrated automatic pressure equalization valve that keeps moisture out and prevents vacuum lock, ensuring the case is easier to open at any altitude. Two over molded rubberized grips are standard on each side and a handle on top of the case is also featured. Genuine Pelican Cases are fully stackable for optimal space efficiency and can always be spotted by their distinctive, trademarked “Dual Band” design. Available in black or desert tan, the 1460 Case is backed by the Pelican products lifetime guarantee. Other idea’s for the use of the 1460 case include video cameras, grip equipment, computer equipment, light meters, microphones or tools. To meet the demand for long, deep and versatile shipping cases, Pelican™ Products, Inc., has introduced the 1740 and 1770 Long Cases. For easy one-person transport, the 1740 comes standard with several mobile-friendly features including two rugged double-wide handles for easy steering and team lifting. Wide-track, polyurethane wheels (for stable mobility) with ball bearings and nylon hubs ensure extended towing durability. Designed to either be moved manually or stacked on pallets, the 1740 features four extra-deep base-to-lid locking cleats that ensure maximum stacking stability. Built for longer equipment and weapons such as .50 caliber guns and survey drill kits, the 1770 Long Case is Pelican’s longest case to date with a length of 54.58”. It features the same transit friendly attributes as the 1740. With more than 6,600 (1740) and 7,300 (1770) cubic inches of usable storage space and an infinite number of internal storage possibilities, both cases feature an open cell core, polymer wall construction engineered to protect sensitive equipment from some of the harshest conditions on earth. Additional standard features include a lid equipped with a polymer o-ring for a dust and water tight seal and six dual action latches that have been tested to withstand nearly 400 pounds of pulling force (but open with a light pull). Genuine Pelican Protector™ Cases can always be spotted by their distinctive, trademarked “Dual Band” design. Due to their large internal volumes both cases feature dual integrated automatic pressure equalization valves that keep moisture out and prevent vacuum lock so they’re easy to open at any altitude. Leveraging next-generation LED technology; Pelican Products has introduced the rugged Nemo 1960 LED as a compact and powerful back up light in its Nemo extreme submersible flashlight line. Engineered with a next-generation LED, the Nemo 1960 LED shines 24 lumens/657 candelas at peak performance (to cut through murky depths or illuminate a dark trail). Powered by 2AAA batteries the flashlight offers more than 3 hours of usable light and a beam that can be seen from 51 meters/167 feet. O-ring sealed and rated submersible to 100 meters/330 feet, the flashlight sports an incredibly tough polymer construction that will stand up to the pressures of the deep and just about anything else that will come along. It weighs in at a mere 1.9 ounces (with batteries) and features an integrated polymer pocket clip. Pelican Products has introduced the rugged 9410 LED as their most powerful handheld flashlight ever. Engineered with an array of four next-generation LEDs, the 9410 LED shines a smoke-cutting 710 lumens/43,200 candela peak beam intensity. The 9410 LED offers three illumination modes (high, low and strobe) with a water-resistant electronic switch that toggles between modes at the push of a button. The switch also features an integrated battery level indicator that illuminates when the light is on – green (more than 75%) – amber (Between 75% and 25%) – red (25% and lower). In high mode the flashlight outputs a beam that can be seen from an ANSI FL1 Standard tested distance of 416 meters/1,512 feet. Powered by the latest in Nickel Metal Hydride rechargeable battery technology, it boasts nearly two hours of run time (4 hours and 45 minutes on low mode). The flashlight is available in black and safety yellow. Like all Pelican flashlights, the 9410 LED is backed by the company’s Lifetime Guarantee of Excellence. Sennheiser came to the show this year with a completely new line of wireless headsets. The RS Series of wireless headset offers up to 24 hours of Headphone operating time, A frequency response of 18–21,000 Hz, and operates in the transmission frequencies of 2.4–2.48 GHz. Also, with the addition of HD video to several lines of SLR cameras currently on the market, there has been a renewed interest in the MKE400 Miniature Camera Microphone. The MKE is a versatile shotgun microphone with a lighting shoe mount to provide professional audio with your small video camera. Da-Lite Screen was keeping up with the buzz over 3D TV & movies with their new Virtual Black 3D projection screen material. Specifically designed and dedicated as the first rear screen 3D projection fabric in the industry, 3D Virtual Black features breakthrough polarization preserving properties engineered by Da-Lite Screen Company’s research chemists. 3D Virtual Black effectively eliminates stereoscopic cross talk or “ghosting” by maintaining 99 percent polarization purity, an industry first for 3D projection. 3D Virtual Black is available in a wide variety of screen types and sizes. Although the folks at American Grip did not have any ‘new’ products for the NAB show they were proud of the ongoing improvements they are continually making to their products. Lance Snoke also confirmed their commitment to customer service and having the products we need on hand. DSC’s major technological breakthrough over typical test charts is precision and increased dynamic range. In addition do DSC’s patented grayscale and color elements, this chart provides many unique features specific to 3-D. DSC charts are designed to produce familiar electronic displays that are easily interpreted using standard waveform monitors and vectorscopes. In production, a few frames shot on set provide invaluable information in post. DSC Labs believes you will find this chart invaluable in aligning your 3-D camera systems. Mole Richardson introduced the Mole LED 12-Pack fixtures consists of 12 OSRAM KREIOS LED circuit boards. Each of those 12 boards contain 20 high output LEDs, for a total of 240 individual sources. Unlike existing LED fixtures, the MoleLED blends these multiple sources into one, soft, single light source. This single source approach renders the light more attractive to the talent and more familiar to the technicians. 0.65 Amps is the maximum Draw at 110 volts A.C. The fixture will operate on 12 volt car battery, 14.4 volt Anton Bauer/IDX V-Mount Battery, 24 volt camera battery or a 30 volt Battery Belt. The MoleLED Single puts the power and quality of light from the 12-Pack in the palm of your hand. The Single is a go-anywhere, rig-anywhere lighting solution designed for use in interviews or on news desks; perfect for car rigs or as an Obie Light; and a great solution for lecterns or podiums. The Single will be packaged in kits of Tungsten or Daylight or a combination of both and powered remotely from the 6-Pack Controller. Unlike any other DC powered fixture today, The Single can be daisy-chained up to three in a row, and remain individually dimmed and switched from the controller. This combination maintains Soft/FX ½ throughout with a range of Black Pro-Mist densities. This filter produces an ethereal mood to your image. Also in the booth were computers so attendees could explore the DFX software suite which allows the user to add filter effects in standalone mode or as a plug-in in Photoshop. Also announced was Version 3.0 of its popular Tiffen Photo fx™ creative effects software, for Apple® iPhone® and iPod Touch® owners. The new Tiffen Photo fx™ 3.0 software available on the Apple iTunes App Store, now features 67 filters organized into 9 different groups and 780 presets, including those filters sets previously available only as paid optional downloads. Adding these filters at no additional cost, plus new filters and effects, makes Photo fx 3.0 an even more incredible, feature rich app. Zylight has also added several new Extender products to their line of camera accessories. The Extender X-110 measures 10.25” stowed and can extend to a length of 19.5” and only weights 6.1 oz. The Short Arm X-SA-100 is a single arm that is durable and even more lightweight than the original articulating arm. The Mini X-M-100 enhances the DV and the consumer shooter arsenal by mounting to smaller cameras everyone can enjoy better lighting, audio and video mounting. It also works great for DLSR shooters by allowing them to attach a light or monitor to their rig. Dedolight introduced it’s brand new 1200w daylight system which includes several new concepts that further improve performance, high efficiency convection cooling, rainproof construction, extremely low UV values, simple hinging open for easy serviceability and the unique optical system Dedolight is so well known for. The 25lb ballast includes a selectable 120w or 800w output power, selectable 50/60Hz silent mode, 75Hz Flicker free mode, DMX control interface, hot restrike and an automated sensing 90-260v input voltage. To top it all off the new Series 1200 light can be outfitted with a special 3-lens condenser module to adapt all other DP400 imager elements and project super sharp images. New to the PanAura soft light line is the PanAura 7 Octodome. This 7’ giant is only 60cm deep and features several different lamping modules including 2x575w, 2x1000w, 4x1000w and each option capable of two different lamps, daylight or tungsten with no color variation. For those of you that like the Dedolight 4 fixture backpacks (DBP) soft case light kits, there is a new 3 fixture backpack (DBPS) for smaller lighter loads. The 400 series now features a wide angle lens attachment with barn door rotating on all access. The focusing range translates into an unprecedented change of angle from 60 to 4 degree (DLWA) and the new wide angle lens attachment widens the angle to an additional 84 degrees (DLWAR400) with perfectly even light distribution, minimal light loss, all while maintaining focus. Dedolight now offers a high tech dimmer to operate lights up to 1000w at 120v. With this elegant in-line dimmer with integrated DMX control, we can not only control many of the Dedolight tungsten soft lights but also lights of other manufacturers. Since these DMX controlled dimmer are noiseless, they can be mounted next to the lights or with an optional c-clamp. The new Fillini Plus on camera lighting fixtures looks very similar to the original Fillini but provides more than three times the LED lighting intensity. It no longer works with (4)AA internal batteries but instead the battery shoes hooks onto the back of the Fillini Plus in versions for Sony, Panasonic or Cannon mini DV batteries. Additionally the fixture can be powered from the DC output of professional video cameras or Anton Bauer Gold Mount plates. The LED’s output daylight color and the fixture includes a tungsten color correction flip down filter designed to withstand a heavy beating. Nila is manufacturing some of the most technically advanced LED lighting fixtures in the television and film industry. Just spending a few minutes looking over their product offering will convince you that they are among the best built and well thought out LED fixtures on the market today. They are impressive. From their 65 watt high light output and lens system to their modular “brick” configuration, they say quality. The fixtures utilize a single-color, high brightness LED light source that boasts a 20,000 hour lamp life. They are available in either “tungsten” or “daylight”. The fixtures have quick change lenses that give 10, 25, 45 and 90 degree spreads. An on-board dimmer with built-in backlit LCD display can control individually per fixture or be networked via DMX or their own Nila NET to control numerous fixtures from one controller with RJ-45 in and out. Input power voltage can range from 90-240VAC, 50-60Hz via an auto-switching power pack. The Model JNH is designed to attach to other same fixtures to create a larger multiple light source in a bank arrangement. With a throw distance of over 100 feet, this bright source can accept a Chimera Light bank with an optional bracket. This light does wonders on location with only a 65 watt power draw. It can also be powered by an optional battery (juice) pack. Other control devices include barn doors, gels and 2 types of eggcrates. They are also incredibly durable as you can see below. For all you space light fans, Nila also makes it’s own version of this popular fixture style with LEDs. It is configured as a LED “bank” of about 30” x 30”. It has an 850 watt output and has similar control as the smaller 65 watt fixtures. It comes with a 36” diameter x 36” high diffusion bag and a variety of targets options. All Nila products are manufactured and assembled in the US. LTM is a part of the Groupe Fokia family. LTM has a long history of manufacturing high quality lighting fixtures for the television and film industries. From it’s popular “Pepper” line to it’s legendary HMI line of fixtures, LTM is well known throughout the world. In keeping with that enviable tradition dating back to the early 1970s, they were showing their 18kW/12kW Cinepar HMI at NAB this year. This new fixture combines performance and sturdiness while being powered by either a magnetic or electronic w/pfc ballast that have been the hallmark of this France based company. With there offices in Sun Valley, California and Paris, France, they are ready to provide support to their extensive distribution network. Look for a new 24kW Cinepar and also pre-made Gel Tubes for fluorescents in the near future. Balcar is also a part of the Groupe Fokia family of product lines. Balcar was one of the early manufacturers of fluorescent lighting fixtures for use in television production. This France based company has, over the decades, made substantial improvements to the design of their fixtures. There fluorescent fixture line is known for their surprising high light output. Their new “Super Lite” is no exception. This new light weight fluorescent fixture was primarily designed for use on location. It is solidly built to prevent twisting during transport, which protects the tubes. They can be attached together to create a run of up to 75 feet all being powered by a single ballast unit, creating a “wall of light”. The fixture has individual On/Off control for each tube at either 110v or 230v. The Super Lite fixture uses a 55 watt T8 fluorescent tube that can also be fitted with T12, if desired. There are also removable barn doors available for light control. All in all this is a very nice addition to their already impressive line of fluorescent fixtures. Most of us know Videssence as the innovator in fluorescent lighting for broadcast television applications. Over the decades they have shown that they have what it takes to defend their marketplace which is now crowded with manufacturers that offer similar fluorescent based products. Enter LED lighting…. LED lighting products abound at NAB this year. The trend towards LED started close to 10 years ago. It was often relegated to accent, set and location lighting for television. It’s usefulness for lighting talent was always hampered by lack of output. LED lighting fixtures just weren’t able to produce the lumens/footcandles needed for key, fill and back lighting. Until now. Videssence has entered the fray with the introduction of it’s new “ExceLED Series” line of LED lighting fixtures. ExceLED’s most notable quality is, you guessed it, light output. There are three fixtures in the series, 25 watt, 50 watt and 100 watt. These fixtures have similar light output to 650 watt, 1,000 watt and 2,000 watt quartz fresnels respectively. With that kind of output, you now have a viable alternative to quartz/tungsten halogen sources at ~1/20th of the power consumption and heat. They will do wonders for your electric bill. Other notable features include models for Non-Dim, On Board Dim, DMX Dim and Phase Dim. They are 3,200K or with optional 5,600K color temperature. Additional control can be achieved with use of gel frame and barn doors that are offered as accessories. My guess is that these new ExceLED Series fixtures, made by Videssence, will have a significant impact on the use of LED for television studio lighting. As in the past, Videssence continues to be an innovator in the field of TV broadcast lighting. Sachtler is relaunching the new versions of the two classics in their medium duty video fluid heads, the Video 18 S1 and the Video 20 S1. They both have a much wider payload range starting at 4 lbs. instead of 15 lbs., making them more suitable for DSLRs shooting HD video. They feature two ranges of counterbalance using their Boost Button, with sixteen steps of adjustment. The Video 18 S1 has a payload range of 4 – 40 lbs. The Video 20 S1’s range is 4 – 55 lbs. 16 x 9, well known for its line of camera and lighting equipment and accessories, is now the sole distributor (available through Barbizon) of the LibertyPak range of range of portable battery power. LibertyPak has been providing high quality lithium-ion battery belts, packs and efficient power management systems since 2002. Introduced this year, were the Little Genny, and the Big Genny. The Little Genny has a 320 Wh. Capacity with a max output of 600 watts. It has 117V AC or 24V output to power just about anything you need in the field or in emergency situations. The size is relatively compact, and the weight is 19 lbs. The Big Genny is the larger version and has a 960 Wh capacity. Charge time is 9 hrs. versus 3.5 hrs. for the smaller version. Both are certified as IATA and DOT compliant, so you can fly with them! New from Chimera this year is the yet to be released soft bank that fits over the Lite Panels 1 x 1 fixture. It will fit over the front of the 1 x 1 with no hardware required using elastic material to secure it on the back of the fixture. It will be available in different grades of diffusion. When the final product is ready well post more info on the Barbizon website. IDX brought out a new high output lithium-ion camera battery in the HL-9 Series. It has an 88 Wh. Capacity and can run the newer HD cameras up to 3 hrs. The new Power link feature allows you to piggyback two batteries together, using the built in V-mount for a total of 176 Wh. It also has a 5 – LED power status displays that shows remaining power in 20% increments. The E-HL9 also supports Digi-View for reading battery status in most camera viewfinders. Litepanels introduced a new series of Sola fresnels. The daylight-balanced Sola series offers beam control of 70° to 10° and single-shadow properties inherent in a Fresnel light, but with an LED light source, use just a fraction of the power of conventional fixtures. Sola Fresnels are said to dim from 100% to 0 with no noticeable color shift, and the Sola ENG provides manual focus and dimming control via camera lens-style ergonomic controls. The Sola6 and Sola12 provide on-fixture motorized control of focus and local dimming via a touch screen, and are also remote-controllable via their integrated DMX interface. Output is flicker free, remaining consistent even as the battery voltage goes down. The Sola 6 draws only 75 watts, but is stated to produce a light output equivalent to a 650W tungsten unit, and weighs 6 lbs. (2.7kg). The Sola 12 inherits the same efficiency drawing only 250 watts, but is also said to produce a light output equivalent to a 2000W tungsten and weighs only 14 lbs. (6.4kg). The Sola ENG is only 4″ x 4″ x 5″ (102mm x 102mm x 127mm) and weighs just 10 ounces (.28kg). Employing a 3″ (7.62cm) lens, it draws 30 watts yet produces output equivalent to a 250W tungsten. The SolaENG runs on 10-20VDC sources such as camera batteries, or via an AC power adapter. It is designed for both on-camera and off-camera mounting. Also new f rom Litepanels is MicroPro Hybrid light, the world’s first Continuous LED light combined with a “Flash” feature. This 9W fixture is the perfect complement for the motion-enabled DSLR cameras that are becoming increasingly popular. Use the “Continuous Mode” for the camera’s video capability and get beautiful wrap-around soft light. Or choose the “Flash” feature to produce a 400% brighter burst–just the ticket for a variety of still images. Kino Flo Introduced New Pole Operated VistaBeams, ParaBeams, ParaZips and Image fixtures. The new Pole-Op Mount let s you hang the KinoFlo lights from a pipe grid and adjust it from the floor. This is common in TV studios, and rare on film sets. The fixture includes a yoke with an attached junior pin. It’s also available with a Pole-Op option with two adjustments. The blue cup controls PAN (left or right) and the white cup controls the Tilt (Up and Down). Kino also introduced the New KF32 Twin lamps for its Vista Beam and Vista Single line of cool lights. The new KF32 displays a smooth beam which responds especially well to the new generation of HD cameras. California Sunbounce introduced the Sun Mover and the Wind Killer. The SUN-MOVER is not another typical pop-up reflector but a flat collapsible light reflector that transforms SUN-LIGHT and STUDIO-LIGHT in a totally controlled way into SPOT-LIGHT and SOFT-LIGHT. Designed by a photographer for photographers, the SUN-MOVER™ truly is the greatest breakthrough in the history of photographic and film lighting via reflectors. The WIND KILLER is a fabric that can be used on various sunbounce Mini, Pro & Big frames. It is stated that the Wind Killer eliminates 75% of wind which is excellent for steadycam operators. At this years NAB, Kata-Bag introduced a new Ultra-light weight backpack called “Bumblebee 222-UL”. This Ultra Light DSLR backpack features a combination of Lightweight technology, materials and Lightweight protection without compromises. The Bumblebee 222-UL has additional storage space for 17″ laptops and other personal effects. When needed the lower compartment can be emptied of the padded dividers and pouches and the zippered partition between the two compartments can be opened to create one large storage space. Also in the Kata area was the Pro-Light FlyBy-76 is a sleek, low profile on board* professional organizer designed to provide the best traveling, storage and working solutions. Lightweight and Protective it will cater to the smallest detail of a professional’s working needs. Specially formed foam encased spring steel Spine Guard for ultimate structural protection, TST reinforced corners, light yet durable RipStop fabrics & meshes, Aeriform foams, Honeycomb panels and Spider Webbing straps all join together to create an extremely protective but light case. The modularity allows you to make it even lighter by simply removing components that are not necessary for your everyday work. Introduced this year was Manfrotto’s new 504 HD head which is a crossover between Photo and Video. This head features a four stop counterbalance with a continuous variable spring which allows you to set for different weight loads ranging from a Video camera or a DSLR camera on a rig. Also included is an easy to use adjustable Pan which not only controls the speed of your pan, but enhances the fluid motions over some previous models. Barco was showing their new RHDM Series High Definition reference monitors. They are now available in both a 17” and 23” version. These units have no fans are 16 x 9 native and have a much better compression ration. Available in the B series supporting standard SD and HD-SDI signal with optional dual line and 3Gb/s HD-SDI and the P Series supporting dual link HD-SDI for post production use. Lowel proudly introduced three new distinctive lighting systems, each designed with today’s professional imaging needs in mind. Blender mixes daylight & tungsten LED’s to quickly match the light quality of your location. SoftCore brings constant source, high C.R.I, fluorescent versatility to your soft box. And TRIO, a lightweight 3 lamp fluorescent fixture, let’s you take your studio on the road. Lowel Blender is a quick, easy to use, LED fixture for location lighting. 2 sets of LED’s in Tungsten & Daylight color are quickly & easily blended. Perfectly match the mixed light sources of your real world location, or create a contrasting color blend to make your subject stand out. The Blender can be powered by AC or battery for maximum flexibility. Twin sets of 5000k Daylight and 3000k Tungsten LED’s, with rotary dimmer controls for each on the back of the fixture. Blender packs more punch than you’ve come to expect from compact LED lights. The lamphead’s compact size (4 x 3 x 3″) makes it small enough to fit on a pistol grip or compact light stand. Powered by AC, Camcorder Battery Sleds, or conventional 12v connections. Supplied with a set of front diffusers for variable softening & diffusing of the blended output. Lowel SoftCore™, a compact light fixture that adds versatility and control to fluorescent softbox lighting setups. This multi-patented modular system uses the fluorescent lampheads of the Rifa eXchange System to light with up to 5 lamps, using most standard softboxes. The SoftCore folds down small for storage or travel. Add there 80 Watt daylight fluorescent lamps for high output with accurate color. Its high frequency ballast is designed for flicker-free hi-res digital still, video, and slow-motion cinema use. The Lowel Trio is for that small studio that you need to occasionally pack up & take on the road? Lowel’s new TRIOTM 3 lamp fluorescent fixture folds down slim, & carries easily. As comfortable in the studio as it is on location, TM delivers a beautiful soft source of high CRI daylight or tungsten color. Its 3 lamps are individually switched, to control light output. Designed with Lowel’s legendary attention to detail, TRIO’s mounting system keeps the light balanced over the stand while allowing a full range of tilting positions. The new Focal Spot 200/400 gives joker bugs projection capability, at less than 10 inches in length and under 1.5lbs. Includes 20 and 40 degree objective lenses, includes four blade cutter and m size gobo holder. Attaches to Joker Bug with no additional parts, assembly or disassembly. Also new from Joker the weatherproof 200/400 and 800 ballasts. Weatherproof, fanless 200/400 auto-sensing weatherproof ballasts with input voltage range of 90-132 180-265 vac with automatic line voltage selection. Amber power ready indicator, easy on/off push button. Grounded US type 120vac power plug. Porta Brace introduced their new line of DSLR Camera Carrying Cases. The cases are made of the 1000 denier cordura material, with the same handcrafted quality construction we are all used to. They have plenty of pockets for accessories and cables and also include a suede shoulder strap. The cases have the slip not dot anti skid bottom panel which is also water resistant. Interiors include the bendable dividers and a combination of padded pouches and fleece microbead pillows for a custom protective interior. The cases are available in the standard porta blue, black , adventure camo and also mossy oak camo. Anton Bauer introduced the Dionic HCX at NAB. Not only does the Dionice HCX have a 120 watt-hour capacity, they also have a unique, built-in motion detection sensor. After a two-week period without a load, the DIONIC HCX automatically goes into “deep sleep,” significantly reducing self-discharge and allowing extended storage with nearly zero capacity loss. To “awaken” the battery for normal use, customers need only move the battery, thus activating the motion detection feature and as a result, “wake up” the battery. This new motion detection feature significantly increases the overall life of the battery by mitigating lithium-ion battery self-discharge when the battery is not in use. Anton/Bauer also has plans to integrate the DIONIC HCX with its signature Anton/Bauer Battery Management System (AB-BMS), which, in the future, will allow users to program the inactivity time length prior to the battery “going to sleep,” further allowing the customer to tailor their battery systems to their specific needs. Weighing just 2.4 pounds (1.09 kg), the DIONIC HCX is capable of withstanding high instantaneous current draws in addition to 10 amp sustained current draws. The DIONIC HCX can power a 40 watt camera with a 20 watt light for over two hours – making it a good choice for users working with on-camera lighting applications requiring a high current draw. In addition, the DIONIC HCX offers an enhanced LCD RealTime® fuel gauge. Users can now quickly and easily check their run-time, with the display showing up to nine hours of run-time when used under low-power load conditions. The new LCD display clearly indicates remaining run-time and battery capacity, showing the number of hours available with a seven segment display surrounded by arcs indicating 15 minute intervals. A battery “gas gauge” indicator also shows remaining capacity in 20 percent intervals underneath the remaining run-time indicators.